“Is there a bathroom?” I asked. I couldn’t read any signs, but I was on a strip of road that led only to more highways. The “back roads” started right around where I’d have to get off to get to the metro. I told him so. “My phone battery’s dying,” he said finally. And that’s what started the panic. It wasn’t the snow or the unending line of traffic. It wasn’t watching my gas tank drop from three-quarters toward halfway. It wasn’t the DJ on the radio running call-in contests for “the poor commuters” who would be stuck for hours. No, none of that made me panic. It was knowing that my husband was stuck in a deserted Metro station with a dying cell battery that pushed me over the edge. Somehow, the image of such lonely helplessness pushed me. I crept along at an excruciating pace. Entire light cycles passed with no movement. Then, it seemed, maybe one car would make it through, and everyone else got to creep up six more feet. I watched the GPS “miles until destination” numbers as they—remained the same. The momentary panic ceased for a moment as I calmed myself. “It’s just snow,” I reminded myself. “I grew up in Connecticut.” But seeing the lines of cars, I knew it was more than that. I was stopped near an emergency access point for about five light cycles. I had more than enough time to contemplate turning around. The road home was still relatively clear, and I knew if I hurried, I could make it back. But I couldn’t just leave my husband. Finally, at the sixth light cycle, I was the lucky car that made it through. I had crossed the Rubicon. It was Metro Station or bust. I took solace in the fact that it was still light out—perpetual winter twilight, but light nonetheless. I estimated I’d be home within the next two hours, and I thought about decedent and calorific foods I could eat to reward myself for this nightmare. It helped for a while. That was it. My overactive writer’s brain swirled with possibilities of all the sinister things that could possibly happen to him. I’d been to the Metro stop plenty of times, but I never paid much attention to what buildings were immediately nearby. It was around this time that I saw the first Pedestrian. His dress slacks looked ridiculous in the weather. The heavy snow has turned to slush that soaked into his shoes and cuffs. He held a laptop case above his head as a defense against the wet snow. I almost opened my window to ask him where he was coming from, and what was so bad that he had decided to walk, but I thought that would be ridiculous. So I turned back to my windshield. By now I had turned down my heater and turned off the radio. Paranoia had slipped in as I watched my gas tank continue to dwindle. I have always been paranoid about running out of gas, and I had thought three quarters of a tank was more than enough to drive the twenty-two miles to the Metro stop. But now I second guessed myself. I knew there was a gas station just up the road, but at this rate it could be hours before I arrived. I took an inventory of useful items in my car: two large blankets covered in dog hair; a snow shovel; three-quarters of a bag of kitty litter; snow boots; two pairs of gloves; an extra hat; a tin of mints. The tinges of panic were still there, and I quelled them for a bit by watching my windshield. The wiper blades pushed the slush to the sides of my window, where it compacted and hung off the side of my windshield until it fell onto my side-view mirror. I wasn’t going anywhere, and it wasn’t like I needed the side-view mirrors to see anything except an endless line of idling cars. Still, it was something I could do. Action I could take. I put on my waterproof gloves, took my ice scraper, and got out of the car to clear off the window. A man in a big-rig to my left stepped out of the car. He was lonely and wanted to talk. “Alright,” I said, trembling. I climbed back into my car. Already, my work on the windshield had become pointless. 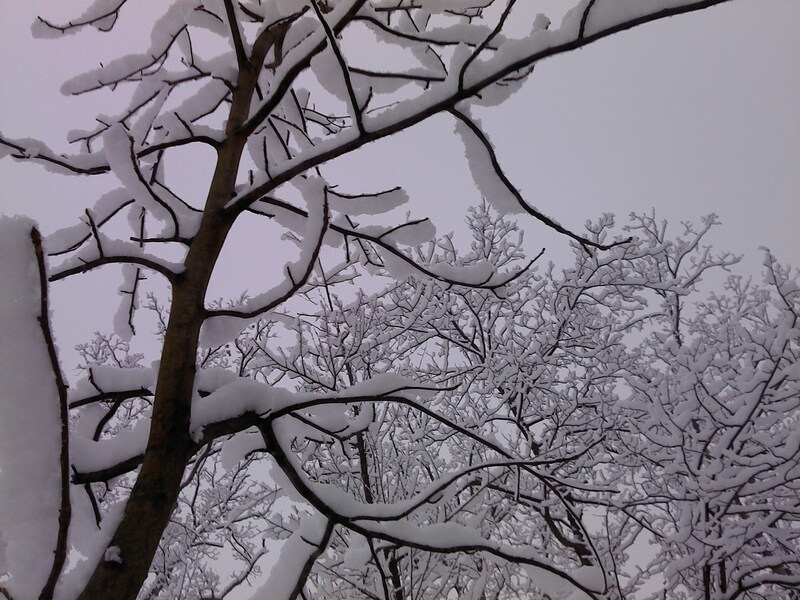 The heavy snow had already started clinging again. My mind went wild, imagining pictures of cars in ten-foot snowdrifts, their owners disappearing forever into the snowy wilderness. I imagined roads so bad that people would have to abandon their cars and seek shelter. After a self-indulgent terror, I realized I hadn’t moved for a really long time. I looked ahead of me. That car from Louisiana was the first car stopped at the traffic light. But each time the light turned green, he fishtailed in place. He was going nowhere. I gave myself a metaphorical slap in the face. There were no ten-foot snowdrifts here. There was a six-inch layer of wet slush, but that was it. I had grown up in Connecticut. I had treaded through waist-high snow before. This couldn’t scare me. I expelled my fears and stepped out of the car, armed with a shovel. I knocked on the door of the Louisiana car. A young man with a pale look of panic rolled down his window. “I don’t know what’s wrong,” he said. “Have you ever driven in snow?” I asked. I explained the basics. He had been slamming on his accelerator as a way of building up momentum, but all it was doing was causing him to spin out of control. Then I shoveled out the slush around his tires. “Slowly, now,” I reminded him. I watched as he pulled away and made it through the next green light. I walked back to my car. The panic was gone. Things were going to be okay. As I continued on toward the Metro, I saw some of the abandoned cars the truck driver had told me about. Some of them were abandoned in the middle of the three-lane road without any effort to be pushed to the side. What had happened to the drivers? Had they run out of gas? Had they, like the Louisiana driver, been unable to move in the slush and given up? Whatever the reason, their abandoned vehicles made navigation a challenge. But I was no longer worried. I was from Connecticut. I knew how to drive in the snow. I could help others. I would get to the Metro. It’s been almost a year since the most ridiculous traffic jam I’ve ever experienced. 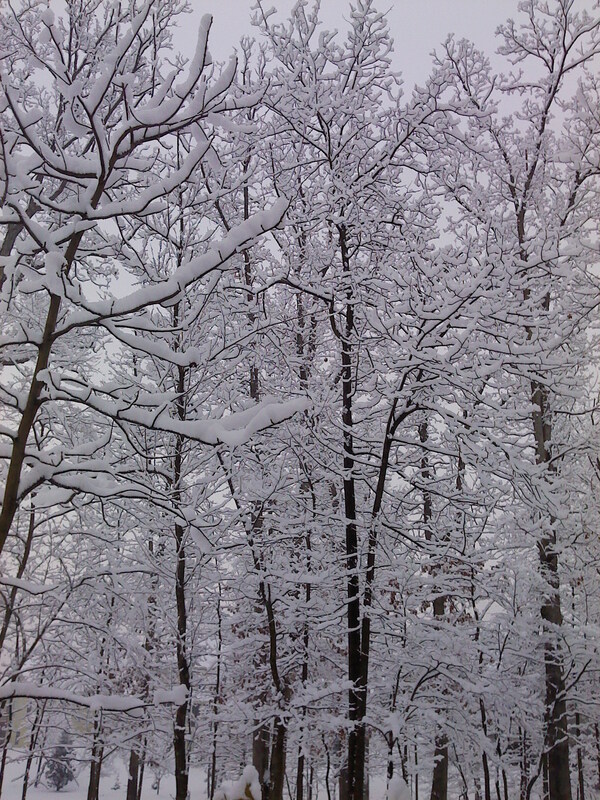 It was our only real snowstorm of the year, and by Connecticut standards (where I grew up) it was hardly even a storm. Still, it was predicted that the storm would come during rush hour, and my husband was at work in the city. I don’t even remember now why I was home. We either had the day off from school, or maybe we were released early. All I remember is it was between two and three in the afternoon, and I was sitting at the kitchen table with a mug of hot chocolate that was too hot to drink. I had just cleared out our garage—a “two” car garage that fits two cars if one has a degree in physics to figure out how to park them. But I was sitting waiting for my hot chocolate to cool and watching the radar map on my computer when I realized that if my husband left when he was allowed to, he would be stuck on a commuter bus for hours. So I called him, told him to get to the closest metro stop (still twenty miles from our house, but at least out of the city), and I’d pick him up. It was a moment of decisiveness, and I didn’t hesitate. I packed boots, snow shovel, winter gear, and kitty litter. I left my hot chocolate on the table. I pulled out of my beautifully-sparse garage. I was off just as the first few flakes of snow floated like dandruff onto my windshield. Growing up in Connecticut, I knew how to drive in snow. I drove cautiously but decisively. I drove well below the speed limit, but I still passed almost every car on the road. I knew I was racing a ticking time bomb, and I knew it would be close. I watched the familiar landmarks fly by. Five, ten, fifteen miles. I watched the snow turn heavy and wet and cling to street signs and traffic lights and license plates. My husband called. He was at the metro stop waiting and wanted to know when I’d arrive. I was five miles away. I estimated ten minutes and turned on my GPS. It was around that time that the car in front of me—an out-of-state plate from Louisiana—fishtailed widely. I eased on the brakes. That’s when I saw the muted red brake lights like bricks in a wall insisting their scarlet hue through the tenacious wet snow. Traffic was at a standstill. Still, it was only 3.5 miles to my turn, and the metro stop was less than a mile from that turn. It was the busy section of Tyson’s Corner, and I assumed the backup was just due to the traffic lights. I called my husband. I didn’t realize how wrong I was. Stay tuned for Part 2, coming soon….